Imagine a perennial foods garden that produces fruits, vegetables, herbs and flowers every season with out having to be replanted, tilled or fertilized with chemicals. Perennials are plants that live for three to many years. They need few inputs (such as water and nutrients) and use little energy compared to conventional annual vegetable and grain crops. Some important food crops come from perennial plants such as mangos, cinnamon, cappers, black pepper, coconut and apples. In cold climates perennial foods include cherries, plums, greens, many kinds of berries and nuts, rhubarb, many kinds of herbs, edible flowers and much more. Growing plants that stay put year after year reduces soil erosion caused by tilling and leaving the soil bare between crops. Also, perennial plants usually put down deep, soil stabilizing roots and have a chance to develop extensive root systems over the years. Less tilling leaves soil microorganisms undisturbed. Fewer resources are used shipping plant starts and seeds around the country each year, and less time is spent replanting. Plants can be attractive whether grown in a food plot or incorporated into your landscape. Many are suitable for containers on patios or balconies. 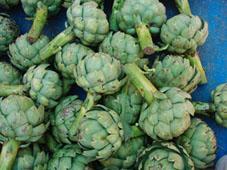 Perennial foods are nutritious and taste great. Many of the vegetables and berries listed below are gourmet treats, hard-to-find and costly in grocery stores, but they can easily be grown at home. Permaculture is the practice of growing foods in an integrated system that mimics the patterns of nature. The Land Institute in Kansas is researching ways to use native plants to create a more sustainable, holistic system for growing food and reduce agriculture's dependence on portable liquid fuels such as oil and ethanol. While the research there is directed at emulating prairie ecotypes, many tropical and temperate permaculture systems are modeled on forest biomes. All permaculture systems are based on protecting and enriching the valuable resource of soil. Growing foods in an important component of this. Bill Mollison, author of 'Permaculture: A Designer's Manual', is considered the founder of modern permaculture. Beginning in the 1970s, he, along with David Holmgren of Australia, developed principles about intentionally designed food production systems, encompassing ethical lifestyle choices and community building as well. Observation of nature's patterns is key to building sustainable systems. Patrick Whitfield's excellent book, 'The Earth Care Manual' is a good place to start learning about permaculture. You can also earn more from periodicals such as 'Permaculture', published in the UK, and 'Permaculture Activist' in the US. And each year there are more permaculture design workshops offered around the world. Perennial plants are easy to grow in any amount of space, in any climate. Choose plants that are hardy in your zone and fit in the in space you have available. This is especially important for trees and shrubs. Good choices for small spaces include strawberries, herbs and greens. Select a site that your plants can grow undisturbed in for several years, or grow plants in containers. Prepare the soil by loosening with a pitchfork and mixing in organic matter. Mulch around your plants with compost to amend soil and shade the roots. For plants that need watering regularly, install soaker hoses or drip irrigation. Below is a list of edible plants commonly grown in gardens, arranged by growth habit. Many types of common weeds and wild plants are also perennial and can be used in salads. Harvest from areas that are not contaminated by traffic exhaust. Grape, Table or Wine, Vitis sp. Wild rose, Rosa blanda or sp.